"excavate" redirects here. For the process of digging, see Excavation (disambiguation). Three types of excavate cells. Top: Jakobida, 1-nucleus, 2-anterior flagellum, 3-ventral/posterior flagellum, 4-ventral feeding groove. 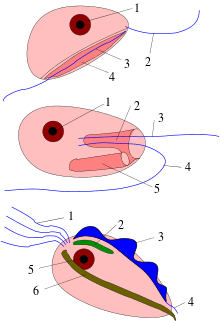 Middle: Euglenozoa, 1-nucleus, 2-flagellar pocket/reservoir, 3-dorsal/anterior flagellum, 4-ventral/posterior flagellum, 5-cytostome/feeding apparatus. Bottom: Metamonada, 1-anterior flagella, 2-parabasal body, 3-undulating membrane, 4-posterior flagellum, 5-nucleus, 6-axostyle. Excavata is a major supergroup of unicellular organisms belonging to the domain Eukaryota. Introduced by Thomas Cavalier-Smith in 2002 as a new phylogenetic category, it contains a variety of free-living and symbiotic forms, and also includes some important parasites of humans. Excavates were formerly considered to be included in the now obsolete Protista kingdom. They are classified based on their flagellar structures, and they are considered to be the oldest members (basal lineage) of flagellated organisms. Many excavates lack 'classical' mitochondria—these organisms are often referred to as 'amitochondriate', although most retain a mitochondrial organelle in greatly modified form (e.g. a hydrogenosome or mitosome). Among those with mitochondria, the mitochondrial cristae may be tubular, discoidal, or in some cases, laminar. Most excavates have two, four, or more flagella and many have a conspicuous ventral feeding groove with a characteristic ultrastructure, supported by microtubules. However, various groups that lack these traits may be considered excavates based on genetic evidence (primarily phylogenetic trees of molecular sequences). Metamonads are unusual in having lost classical mitochondria—instead they have hydrogenosomes, mitosomes or uncharacterised organelles. The oxymonad Monocercomonoides is reported to have completely lost homologous organelles. Malawimonas appears not to belong to Excavata as it is close to Collodictyon which either appears close to Amoebozoa or they form a basal Unikont clade together. ↑ Hampl, V.; Hug, L.; Leigh, J. W.; Dacks, J. B.; Lang, B. F.; Simpson, A. G. B.; Roger, A. J. (2009). "Phylogenomic analyses support the monophyly of Excavata and resolve relationships among eukaryotic "supergroups"". Proceedings of the National Academy of Sciences. 106 (10): 3859–3864. doi:10.1073/pnas.0807880106. PMC 2656170 . PMID 19237557. 1 2 Hampl V, Hug L, Leigh JW, et al. (2009). "Phylogenomic analyses support the monophyly of Excavata and resolve relationships among eukaryotic "supergroups"". Proc. Natl. Acad. Sci. U.S.A. 106 (10): 3859–64. Bibcode:2009PNAS..106.3859H. doi:10.1073/pnas.0807880106. PMC 2656170 . PMID 19237557. 1 2 Simpson, Ag; Inagaki, Y; Roger, Aj (2006). "Comprehensive multigene phylogenies of excavate protists reveal the evolutionary positions of "primitive" eukaryotes" (Free full text). Molecular Biology and Evolution. 23 (3): 615–25. doi:10.1093/molbev/msj068. PMID 16308337. 1 2 Cavalier-Smith, T (2002). "The phagotrophic origin of eukaryotes and phylogenetic classification of Protozoa.". International Journal of Systematic and Evolutionary Microbiology. 52 (2): 297–354. doi:10.1099/00207713-52-2-297. PMID 11931142. ↑ Simpson, AG (2003). "Cytoskeletal organization, phylogenetic affinities and systematics in the contentious taxon Excavata (Eukaryota)". International Journal of Systematic and Evolutionary Microbiology. 53 (Pt 6): 1759–1777. doi:10.1099/ijs.0.02578-0. PMID 14657103. ↑ Dawson, Scott C; Paredez, Alexander R (2013). "Alternative cytoskeletal landscapes: cytoskeletal novelty and evolution in basal excavate protists". Current Opinion in Cell Biology. 25 (1): 134–141. doi:10.1016/j.ceb.2012.11.005. PMC 4927265 . PMID 23312067. ↑ Simpson AG (2003). "Cytoskeletal organization, phylogenetic affinities and systematics in the contentious taxon Excavata (Eukaryota)". Int. J. Syst. Evol. Microbiol. 53 (Pt 6): 1759–77. doi:10.1099/ijs.0.02578-0. PMID 14657103. ↑ Laura Wegener Parfrey; Erika Barbero; Elyse Lasser; Micah Dunthorn; Debashish Bhattacharya; David J Patterson; Laura A Katz (2006). "Evaluating Support for the Current Classification of Eukaryotic Diversity". PLoS Genet. 2 (12): e220. doi:10.1371/journal.pgen.0020220. PMC 1713255 . PMID 17194223. ↑ Derelle, Romain; Torruella, Guifré; Klimeš, Vladimír; Brinkmann, Henner; Kim, Eunsoo; Vlček, Čestmír; Lang, B. Franz; Eliáš, Marek (2015-02-17). "Bacterial proteins pinpoint a single eukaryotic root". Proceedings of the National Academy of Sciences. 112 (7): E693–E699. Bibcode:2015PNAS..112E.693D. doi:10.1073/pnas.1420657112. ISSN 0027-8424. PMC 4343179 . PMID 25646484.